For so long, USB keys have been a nice out-of-band infection vector. People like goodies and people like to plug those small pieces of plastic into their computers. Even if good solutions exists (like BitLocker - the standard solution provided by Microsoft), a lot of infrastructure are not protected against the use of rogue USB keys for many good or obscure reasons. There are also multiple reasons to receive USB keys: from partners, customers, contractors, vendors, etc. The best practice should be to scan any suspicious device against malicious documents but how to achieve this in a safe AND not boring way. If you propose a tool that is easy to use, you will increase your chances to have it adopted by more people! What does it do? Multiple operations are performed on files, based on their MIME type. Example: Word files are converted to PDF then to HTML. Other files are renamed and prepended with a "DANGEROUS_" prefix. 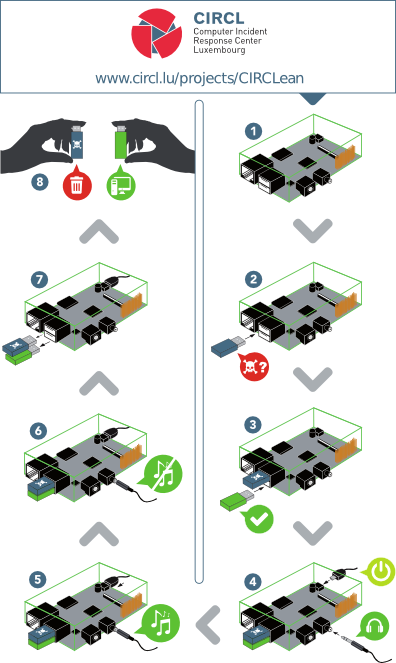 Once sanitized (or non dangerous), files are copied to the destination USB key. The code is available on their github repository. Nice idea, but does it also check for malicious USB controller (in the USB device) modifications? @anon: "does it also check for malicious USB controller modifications?" It shouldn't need to, as you're not going to be plugging the questionable device into your computer. However, it would be great if it *could* detect such modifications so that you could be informed to destroy the USB stick. Quoting John Hardin: @anon: "does it also check for malicious USB controller modifications?" With respect, you cannot rely on that. As I understand it, the ultimate problem with a malicious USB controller is that it allows attackers choice as to when and where to present malicious material & when not. Of course the copy process can protect targets down the line from such duplicity, so it does help. But, the CIRCLean device becomes one of "your computer"s too. It will be a target for malware. It may have a much restricted attack surface, but if it became popular then it would be single well understood target for a malware author. If necessary the CIRCLean device could be attacked by a malicious controller, once the scanner was owned it could potentially infect other USB controllers, plus the bonus of being able to infect other clean material it scans. All that said, the process of transforming documents to less dangerous document formats could be a very worthwhile gain for run of the mill work. People may think this nit picking, but I did not want leave this unremarked. Have you got it to work with the latest prebuild image. I cant seem to get anything good with the Raspberry PI 1 or 2.